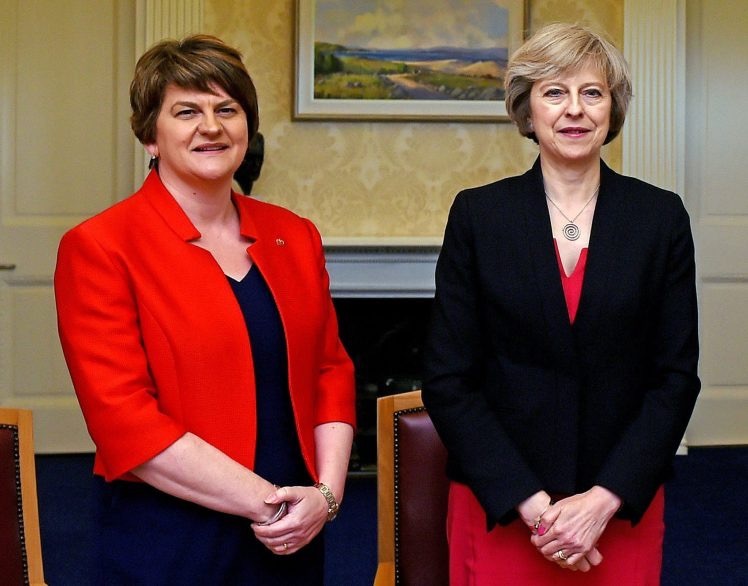 There’s been a lot of hot air expressed since the election about the Conservatives’ tie up with the Democratic Unionist Party (DUP). I think it is important to take a step back and look at Theresa May’s choices from a constitutional perspective. She was, electorally, very much between a rock and a hard place. The country needs a Government and given the seat counts she had little alternative but to do what she has done. That doesn’t mean the decision isn’t problematic though. To be able to govern, a political party or group of parties has to be able to get their Queen’s speech (a statement of their immediate governing programme) through Parliament. This requires 326 votes. If a party can’t get their Queen’s speech through Parliament there are 14 days for another party or group of parties to get their Queen’s speech through Parliament. Here are some facts. Fact one is that the Conservatives have 318 seats. Fact two is that Labour has 262. Fact three is that if you added to Labour’s seats those of the Liberal Democrats, the SNP, Plaid Cymru and the Green MP, that adds up to 315 seats. Fact four is that DUP has 10 seats and Sinn Fein have 7 seats. Fact five is that Sinn Fein refuse to take up their seats in Parliament (although they do, of course, claim expenses), so actually 322 votes are needed to get a Queen’s speech through Parliament. So, for Labour to be able to form an alternative Government they would have needed the DUP to vote with them or some Conservative MPs to vote with them. Let’s look at the chances of either happening: The DUP are effectively Northern Ireland’s UKIP, but more extreme. For religious reasons they are anti gay marriage and anti- abortion. They don’t really believe in climate change and they are pro-grammar schools. Furthermore, what do you think would happen when Jeremy Corbyn approaches the DUP to offer some sort of deal? Jeremy Corbyn has been a supporter of the Irish republican cause all his life, hosting Gerry Adams for tea in Parliament and attending the funeral of convicted terrorists before the Good Friday Agreement was signed. The DUP, who are as extreme in their commitment to the Unionist cause as Sinn Fein are to the Republican cause, would at the very best laugh at the idea. Would some Conservatives on the left of the party vote with a Labour Queen’s speech? Well, ideologically some of them are closer to the right of the Labour Party than they are to Theresa May. Some of them are highly committed Remainers too, so that apparently is why they might vote for a Labour Queen’s speech. But now let us return from cloud cuckoo land. We have just had an election in which the parties are highly polarised and yet a Conservative MP will be going back to their constituency to explain that they have put a Labour Party further to the left than any previous one in Government? You really think so? Theresa May’s constitutional responsibilities are to try to form a government. She could do that by governing as a minority government, with a highly informal agreement the DUP will always vote with them. But those informal agreements can break down very quickly and be chaotic. She wasn’t going to form a coalition with them, given the more extreme elements of their programme. Instead, the ‘confidence and supply’ agreement which has been made, in which the DUP will support them in any vote of confidence and any budget vote, is the middle ground that at least gives us a Government. If Labour had won more seats, and the Conservatives fewer, maybe May would have seen that an alternative government is possible. But the fact is that it isn’t possible, so if May decided not to bother trying to form her own alternative, she would leave the country in constitutional limbo. Yes, the tie up with the DUP brings its own problems. But they are more likely to ask for the pensions triple lock and winter fuel allowance to be restored than to demand gay marriage is got rid of. The thought police on the left of politics seem to have ignored the fact that their views on welfare, inequality and economics is far nearer to Labour than the Conservatives are. They are also wanting to remain in the customs union at the very least, if not the Single Market, and would still want a soft border to be maintained with the Republic of Ireland. The biggest issue is the neutrality of the Government in the Northern Irish peace process at a time when the Northern Irish Assembly still can’t be formed. The Good Friday Agreement is lodged with the United Nations and forbids the UK Government from favouring one side over another. But let’s not pretend the Conservatives were ever anything other than Unionist anyway. It’s in their full name. Like it or not, given the election result, Theresa May did what she had to do to make sure the country had a Government. The idea that anything else was possible is for the birds.